Switzerland has become the first among nations to submit its Intended Nationally Determined Contributions (INDCs) to reduce greenhouse gas emissions to the United Nations, with the EU closely following suit. Detailed information of their INDCs can be accessed on the UNFCCC website. Switzerland has witnessed a temperature rise of 1.75°c due to global warming since 1864 when record-keeping began. It intends to set up new policy frameworks and build on existing strategies “to cut emissions by 50 per cent by 2030”. This includes “elaborating a draft for consultation at national level of its national climate policy for the period 2021-2030.” The country shall also partly use carbon credits from international mechanisms to offset emissions. Switzerland also “supports the inclusion of international aviation and shipping on the basis of future internationally agreed rules”. Currently, though, aviation and shipping do not form part of its INDCs. The rich European country’s long-term goal is to reduce its emissions by 70 to 85 per cent by 2050 compared to 1990 emission levels. This includes reducing its per capita emissions to 1-1.5 tCO2 eq in the longer term. Currently, Switzerland’s per capita emissions are 6 tCO2 eq. In comparison, India’s per capita emissions currently stand at a paltry 1.93 tCO2 eq. 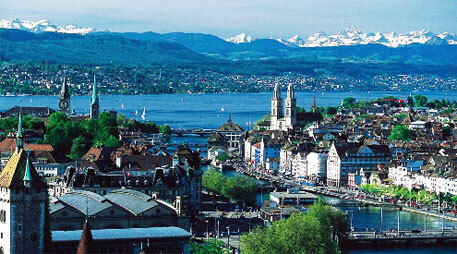 In 2025, Switzerland anticipates the reduction of its greenhouse gases by 35 per cent compared to 1990 levels. Closely following Switzerland in leading efforts to formulate INDCs, the European Union (EU), too, has submitted its climate action plan in the form of quantifiable INDCs. In line with its objective of cutting its emissions by 40 per cent by 2030, the EU, like Switzerland, has chosen the year 1990 as the baseline and covers almost all sectors, including waste and agriculture. The aviation sector is, however, not explicitly mentioned. The EU, though, has been criticised by the civil society for its 40 per cent emission reduction target which it is believed is not ambitious enough. The EU, in its INDC, focuses on including land use, land use change and forestry (LULUCF) in its 2030 mitigation framework before 2020. EU, which is now a 28-member group, will submit its legislative proposals to implement the 2030 climate and energy framework, “both in the emissions trading sector and in the non-traded sector to the Council and European Parliament in 2015-2016”. However, as opposed to the Switzerland’s climate action plan, there is no contribution of international credits to EU’s emission reduction plans. EU considers its INDC as fair and ambitious as it is progressive in comparison to 20 per cent by 2020, which it had proposed earlier. According to the EU, this target is also in line with 80-95 per cent cuts by 2050 against 1990 emissions levels. As a part of the agreed process at the Lima climate summit, a synthesis report, in October 2015, would compile the aggregate result of INDCs to determine whether they will limit temperature rise the 2°C target, required for preventing dangerous anthropogenic effects of climate change. It is to be noted that India would submit its INDC by June 2015. INDCs would form key element of the Paris 2015 agreement where countries are scheduled to sign a new climate agreement which would come into force by 2020.